The GLEAMviz Simulator is a desktop application, meaning that in order to use it you will need to install the application on your computer. The software is available for Windows, Mac and Linux. then run the installer and the GLEAMviz Simulator will be ready to use in a while. (Linux users might have to set the executable permission on the installer file and/or run it from the terminal, depending on the OS distribution configuration). Please note that according to your security settings you might need to explicitly allow the execution of the installer. 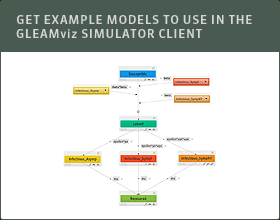 To learn more on how to get started: watch a ten minute tutorial on how to set up your first simulation and get a first introduction on the things you can do with GLEAMviz. The tutorial illustrates the basic operations needed to create a compartmental model, define the initial conditions of the simulation, manage the simulation files and visualize the results. Operations concerned with the export of data and setup configurations are also briefly covered. Note that this tutorial uses an older version of the software, with a different user interface. The GLEAMviz computational tool, a publicly available software to explore realistic epidemic spreading scenarios at the global scale. W. Van den Broeck, C. Gioannini, B. Gonçalves, M. Quaggiotto, V. Colizza, A. Vespignani. BMC Infectious Diseases 11, 37 (2011). Seasonal transmission potential and activity peaks of the new influenza A(H1N1): a Monte Carlo likelihood analysis based on human mobility. D. Balcan, H. Hu, B. Goncalves, P. Bajardi, C. Poletto, J. J. Ramasco, D. Paolotti, N. Perra, M. Tizzoni, W. Van den Broeck, V. Colizza, A. Vespignani. BMC Medicine 7, 45 (2009).